Bring your sweet tea and pick a porch! 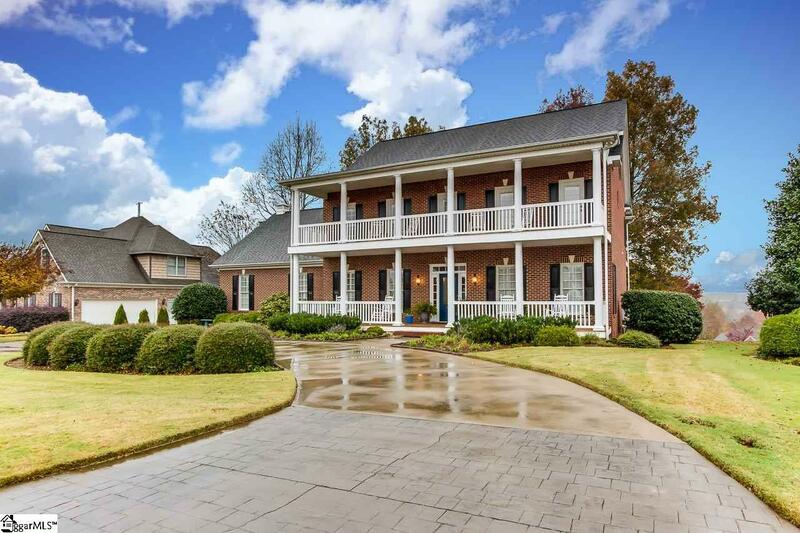 This southern-inspired home promises charm and comfort. Brilliantly maintained and excellently designed, this home boasts a floor plan perfect for gatherings and relaxation. The chef-inspired kitchen supports the cook with plentiful cabinets, abundant prep space and an oversized island, perfect for casual meals. The warm living room, invites you with a stunning fireplace and an open wall of windows, overlooking the golf course. The formal dining room is suited for large parties, and the den is perfect to serve as an additional gathering space or a main floor office. The original design called for this be a bedroom - with the proximity of the full bath, this room could easily serve as a 4th bedroom! The original design for the home included a bedroom on the main level, which the current owners are using as a den. The upstairs features 2 large bedrooms, adjoined by a full bath, a master bedroom with renovated en suite and private office and a 21x15 bonus room with it's own half bath and additional, private access. Porches can be accessed from all bedroom and both the front and rear of the main level. This home is a true sanctuary! Beyond the home, this practical location of this home puts you less than 15 minutes from Downtown Anderson, less than 20 minutes from Clemson and less than 30 minutes from downtown Greenville! The benefits of this golf community include golf, pool and tennis. Come experience a special lifestyle!